Gujarat Univeristy, Navrangpura, Ahmedabad � 380009. But afterwards there was an increase in the number of colleges and also in the strength of participants. Therefore, it was divided first into three zones and then consequently into five zones. At present, almost five thousand students take part in the youth festival with all their enthusiasm and zeal. The department aims at providing students with cultural environment so as to shape their alround personality and develop their physical, mental, social, aesthetical and spiritual dimensions and cultivate basic human qualities like honesty, integrity, industriousness and tolerance. So that they may prove to be our cultural custodians and make wonderful citizens of our great nation. Of course, our youth always turns to the sunny side of our youth festivals like marigolds to blossom fully, to grow perfectly and to shine out distinctly. They expand the horizons of their talent, their skills and their expertise through the pilgrimage of youth festival every year. Youth festival for them is a fulfilling, sustaining and developing artistic experience through which they take an arrow-like flight towards their grandest goal and distinct artistic aim. So, they always desire, aspire and avail this excellent opportunity. That offer them a sound platform to exhibit the endless reservoir of their unexpressed abilities and to showcase the complete menagerie of their unfathomed capabilities and unexplored dreams. Let us wish them an ever-shining future and ceaseless artistic advancement. 2. Inter Zonal selection of best three participants for each event by Youth Welfare Department, Gujarat University, Ahmedabad for Inter University (West Zone) Youth Festival. (5) Mahatma Yogeshawarji Lecture series. (c) To Organize Bank of Baroda Trophy debate contest. (C) To Organise Inter University Exchange Programme for the student welfare members of Gujarat University. Mountaineering, (Basic, Advance course), Expedition, Trekking, Hyking etc. Music, Dance, Literary Events, Theatre, Fine Arts, Photography, Leadership Training camps in summer & Diwali vacation. 1. 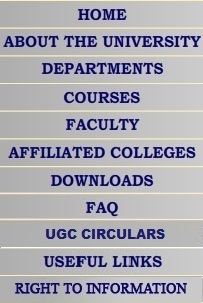 Only bonafide, full time student, who is enrolled for a degree or post degree or diploma course which is of a minimum duration of one academic year and whose examination is conducted by the University subsequent to passing the 12th class examination under the 10+2 pattern of education conducted by a recognised Board of Higher Secondary/Senior Secondary in the country or an equivalent examination shall be eligible to participate in the Inter University Cultural Activities. 1.1 Students of Open Universities shall be considered to be bonafide students and shall be eligible to participate provided they fulfil other conditions. However, students enrolled in correspondence course. Institutes of Universities, casual students, external students and students pursuing bridge courses shall not be eligible. ( a ) Not more than 7 years have elapsed since a student passed the examination qualifying him/her for first admission to a degree or diploma course of a University or College affiliated to a University. ( b ) Only students, who are less than 25 years of age as on 1st July of the academic year in which the activity is held, can participate. ( c ) Further, students can participate for one year more than the normal length of the academic programme which he/she is following. 3. A student employed on full time basis shall not be eligible to participate. 4. A student shall not be allowed to represent more than one University during a single academic year. 5. Provisional admission to a course of a University or College shall not make the student eligible to represent the University in the Inter University Youth Cultural Activities. 6. In case of a student migrating from one University to another, his/her migration case will be considered eligible only after his/her admission in the new University is regularised and he/she is admitted as a bonafide student by the new University. 1. For the purpose of computing years of eligibility, one year means the academic year in which the cultural activity is held irrespective of whether the student�s result is declared or not. It will normally be extended from June/July to 12 calendar months of the next year. 2. The restriction of participation in Inter University Youth Cultural Activities to a period of one year more than the lengh/duration of academic courses means that the students pursuing a three year degree programme ( i.e. B.A., B,.Com., B.Sc. etc. ) can participate for four years, while a student pursuing four year programme ( i.e. B.E., B.Tech. etc. ) can participate for five years. 1. Any disqualification of a participant on grounds of ineligibility will result in the automatic scratching of the contingent for that academic year. The contingent shall also be debarred from participating in the youth cultural activities to be held in the following years. 2. A participant disqualified on the grounds of ineligibility shall not be permitted to participate in Inter University Youth Cultural Activities in the next year. N.B. : (1) Please note that Five events which have been star marked (*) above shall get 15 seconds Grace Time after the completion of the Maximum time limit. However, for all other events, the Grace Time limit shall be 30 seconds. (2) Please note that three events which have been cross marked ( � ) above are to be performed in Inter Zonal Gujarat University Competition level only. 1. All pariticipants who are regular students must bring their identity card with photograph duly signed by the principal of the college. Accompanists, however should bring an authority letter from the college as it is required. 2. All participants should abide by the rules and regulations, as decided by Youth Welfare Department, Gujarat University, Ahmedabad-9. 3. A participant can take part in two individual events and any group events. 4. The Jury of Judges has a right to accept/reject any presentation without giving any reason. 5. Participating college can send atleast one, if necessary two, incharge professors, who will maintain a liaison with the Organising Committee of youth festival. 6. No official or any member or Institute of university should go to the press or media on any contraversial issue. The person violating this clause should be liable to bear disciplinary action decided by the Organising Committee. 7. The Director and Youth Festival Zonal Chairmans. Gujarat University, will appoint Event Conviner, committee members & officials to conduct the competitions and make announcements. No other teacher/student will be allowed. 8. The Director and Youth Festival Zonal Chairmans, Gujarat University, have right to delay / Postpone any item due to unavoidable circumstances. 9. Team / Teams will compete according to lots drawn and announced by the Director of Youth Welfare and The Zonal Chairman. 10. Only three calls will be given during which the concerned teams will have to report at the stage, failing which, the next team/teams will have to be ready to perform. (1) Only one entry per Instution is allowed. (2) Time for Stage / Instruments setting is maximum 5 minutes. (3) Maximum number of accompanists is two. (4) Item can be presented in either Hindustani or Karnataki Style. (5) Cinema songs are not allowed under this item. (6) Sufficient thought and care must be exercised in the choice of raga and composition. (7) Judgement will be based on the qualities like swara, tal, selection of raga, composition and general impression. (8) Duration of performance � 15 minutes. (4) Participants must bring their own instruments. (5) Item can be presented in either Hindustani or Karnataki Style. (6) Judgement will be based on the qualities like tal, selection of Raga, composition and general impression. (7) Duration of performance � 15 minutes. (4) Participants must bring their own instruments, casio is not allowed. (5) Instruments of western origin adopted to the Indian Raga system are allowed. (6) Item can be presented in either Hindustani or Karnataki Style. (6) Judgement will be based on the qualities like swara, tal, selection of raga, composition and general impression etc. (6) Judgement will be made on the qualities like composition, rhythm, co-ordination and general impression etc. (2) Two group songs will be presented by the same team out of which one will be a Folk song while another a Patriotic song. (7) Judging of this item will be on the basis of quality of singing only and not on make-up, costumes and actions of the team. N.B. : In the item of Group Song (Indian) there will be a limit of 4 (four) instruments including all the instruments played by the accompanists & student. Student can play only one Instrument from the team participating. (5) Judging of this item will be on the basis of quality of singing only and not on make-up, costumes and actions of the team. (8) Judgement will be based on the basis of Rhythm, Formation, Expression, Costumes, Make-up, Sets and Overall Effect. (9) Time for Sets / Instruments setting is up to 5 minutes. (2) The classical dance can be from any of the approved schools of dances such as Kathak, Kathakali, Bharat Natyam, Manipuri, Kuchipudi, Mohinittam and Odissi etc. (4) Judgement will be based basically on the qualities like Tal, Technique, Rhythm, Abhinaya or Expression, Costume, Footwork and General Impression etc. (5) Three copies of a brief note on the description of dance story involved in it, if any, and of the accompanying song, if any, with its meaning in Gujarati, Hindi or English must be submitted at the time of registration. (1) Each institute can send a team of three participants. (2) There will be a written preliminary round and five teams will be selected for the final one. (3) The finals will be oral with audio-visual questions. (4) The specific rules regarding evaluation procedure, time to reply a particular answer and the type of round will be given before the actual start of the competiton. (3) Each speaker will be allowed to speak for a maximum of five minutes in the Zonal festival and 5 minutes in the Interzonal Festival. (4) Subject/Topic of Elocution will be announced 3 days before the competition. (5) The performance will be judged in one language. (6) The item shall be prose or poetry and not song. (7) The sequence of speakers will be decided by a draw of lots. (1) Each Institute will be represented by the two debators, one will speak for; while another will speak against the motion. (4) Each debator will be allowed to speak for maximum of 5 minutes both in the Zonal Festival and in the Inter zonal Festival. (5) The competitor from each Institution will speak for and the other against the motion. (3) The person incharge will give Topics to the participant 3 minutes before presentation. (6) Judgement will made on clear tone of voice, flow of presentation, confidence, subject awarencess, no repetition of topic and sentence and general impression. (3) Maximum time allowed to each participant shall be 5 minutes while minimum 4 minutes. (4) The title of poem and name of author should be given to professor incharge in advance. (1) Each institute can send only one entry. (3) The opening line of poem will be given at the beginning of competition. The participant has to complete within 1 (one) hour. (4) Duration for recitation by participant is maximum 3 minutes. (2) The duration of the play should not exceed 30 minutes. Time will be counted as soon as the signal is given or the team starts giving the introduction, whichever is earlier. Empty stage to be followed strictly. For stage setting and removal of set and properties, upto 10 minutes will be given after taking charges of the stage. (3) The number of participants should not exceed nine and the maximum number of accompanist should not exceed three. (5) The play may be in Gujarati, Hindi, English or any regional languages of India. In case, the language is a regional one, the synopsis of the play with translation in Gujarati, English or Hindi must be submitted to the incharge of the competition on the day of registration. Adaption of western play is not allowed. (7) Judgement will most likely be based on the qualities of the play like performance, theme, acting, stage craft, design and general impression etc. (8) Decision of the panel of judges will be final and binding upon all. (9) Accompanists will either speak from the background or can play musical Instruments for background music. They shall not appear on the stage. (2) Maximum number of six participants are allowed to participate in a team. (4) Use of make-up, drapery and background music is allowed. No. personal remarks. aspersions, character, as assassination etc. is allowed. (6) The item will be Judged basically on the qualities like theme, acting, stage craft, design and general Impression. (7) Vulgarity or bitter insinuations in presentation should be avoided. Only innocent satire or humour is expected. (3) Judgement will most likely be based on qualities like idea, creativity of presentation, use of make up, music and general impression. (4) Duration of performance shall be between 4 to 5 minutes. (5) Participating team cannot use costumes, sets or properties like those used in a play. Make-up, dress and music can be allowed. (3) Only one Participant is allowed. (5) Medium of expression can be a Gujarati, Hindi or English. (6) It should necessarily be cultured and pleasant piece of art. (6) Judgement will be based on relevance, quick response, acting, theme, costume and general impression. (5) Painting can be done in oil, water, poster or pastel colours. Mixing of two medium is not allowed. (6) Candidates will bring their own material like brushes, paints, etc. Only the paper/sheet will be provided by the host Institute. (4) Participants are requested to bring their own scissors and pasting material along with old magazines and newspaper. (5) Collage has to be prepared from old magazines or newspapers. The host college will provide the drawing paper of the size 22� � 15�. (2) Item will be conducted on the spot and the participants will be requested to do poster making on the subject topic/theme given. provided by the host College/University. (1) Participant can compose human figure, animals or birds. Topic will be given on the spot. (5) Participant will bring their own clay. (6) Size of the item should be not less than 10� in height of synthetic clay & requested material. A base (of cardboard or wood) can be used to display the model. (3) Duration will not be more than 2 hours 30 minutes. (4) Participant will bring their own material. Only the drawing paper (22�x15� size) will be provided by the host College/University. (5) Idea would be innovative and original. (3) Participants will bring their own material. This art is known differently in various regions such as Mandna, Alpana, Alekhan, Kolam, Rangoli etc. For this the medium and form for expression can be free hand, pictorial or descriptive. (4) Any medium may be used-Poster Colours, Flower Petals or saw, dust or pulses or rice without pasting. (6) Participant will bring their own material. Only the rangoli space (2�x2� size) will be provided by host College/University. The participants are requested to study the rules and regulations carefully for the various events, given in this booklet. The decision of the judges appointed for different events will be final. It is expected that their judgement will be respected. In case of any dissatisfaction, the matter may be referred to the Jury of Appeals. The protest, if any, should be lodged with the Convener of the Competition within one hour of the end of the competition. No protest shall be entertained on matters regarding judgement. Protests can be entertained on matters relating to violation of rules or improper conduct of the contest. There will be a protest fee of Rs. 500/- only. This fee will not be refunded unless the protest has been upheld by the Jury of Appeals. No appeal shall lie against the decision of the Jury of Appeals.